How to Do a Poster Presentation Yourself? 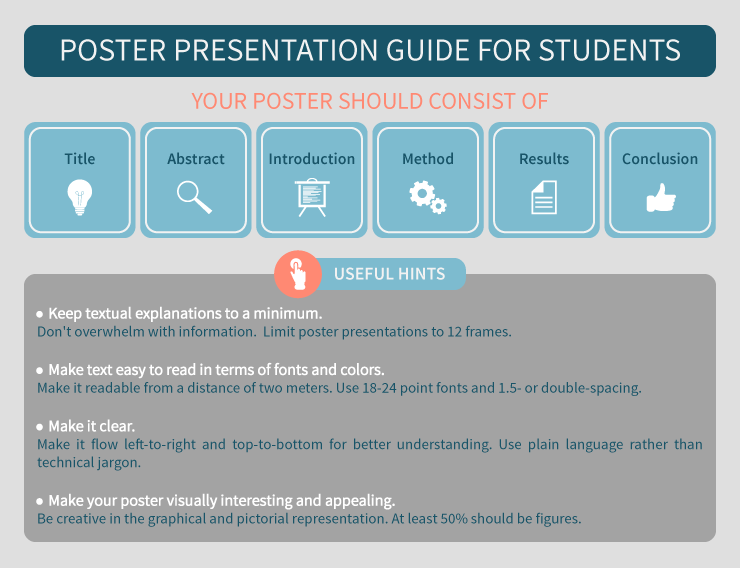 Many students who prepare their research project are forced to participate in all sorts of conferences and academic discussions, so quite often they have a question: how to do a poster presentation? Before we explain the details and techniques of the poster presentation, let us figure out the poster itself. The poster is a way to organize your text, images, graphs and other types of data that represent the results of your research within a certain project. Such posters might be used as a part of the presentation or as a separate display. If we are talking about technical details of the presentation poster, it should be printed on the thick paper, approximately A0 size (or any other if specified by the requirements). If the poster is supposed to be displayed for a long time, you may need to consider plastic or commercial fabrics as a more durable material. Similar to other processors, PowerPoint will give you a chance to choose the size of the poster, however, we would recommend you to multiply them by 2, so when printed, the quality is impeccable. While saving/exporting your final poster, make sure to save it in different formats before you send them to be printed. How to Do a Poster Presentation? Once you are standing on the conference next to your poster, try not to cover it with any parts of your bode. If you see someone looking at it, five them at least 20 seconds to quickly browse through and after that let them know you are available for any questions they may have. If you have a large amount of data or you are looking for sponsors for further research you may need to prepare leaflets for people to take once they move on. This way, they will have your contacts and follow-up reading. How to Cite a Poster Presentation? Author Last Name, First Initial. Name of the conference, Location. If you are looking for some poster presentation examples, check the samples we have on our website by clicking here or simply search the web for that. However, keep in mind that certain formatting details might not fit the recommendations you are obliged to follow while preparing your poster. If you think that it is too complicated to deal with on your own, you can place your request for professional help right now!